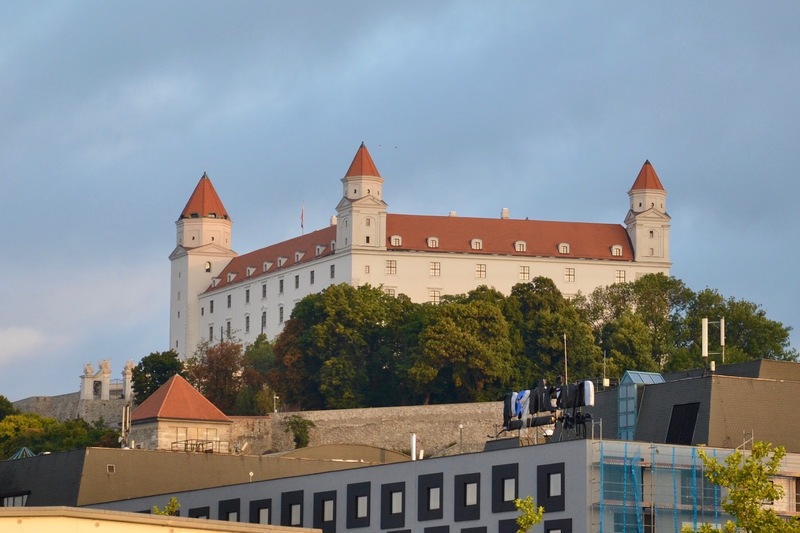 I was up on deck early as we sailed into Bratislava, you could see the city for some distance – high on a hill to the north, the Castle guards the city, like the perfect gleaming wedding cake. A newer shape, the ‘UFO’ Observation Tower, dominates the river skyline atop the New Bridge, the world’s largest single-pylon suspension bridge. Bratislava sits on the Danube and has been fought over by its neighbours through the centuries. But this city has risen from the 20th Century, as capital of Slovakia since the Velvet Divorce when Czechoslovakia overthrew the Communist regime and peacefully split in two. We dock and head into the city with our local guide, Andrea. As we step onto land we cannot avoid the large Soviet style statue. 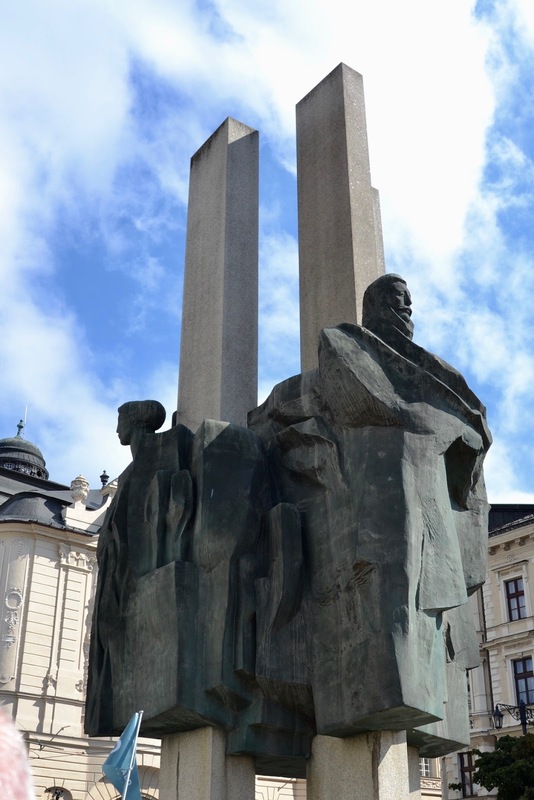 When the Communists seized Slovakia in 1948 they decreed that all monuments celebrating religion (Virgin Mary) or imperialism (the Hapsburgs) be removed and replaced with celebrations of workers or culture. 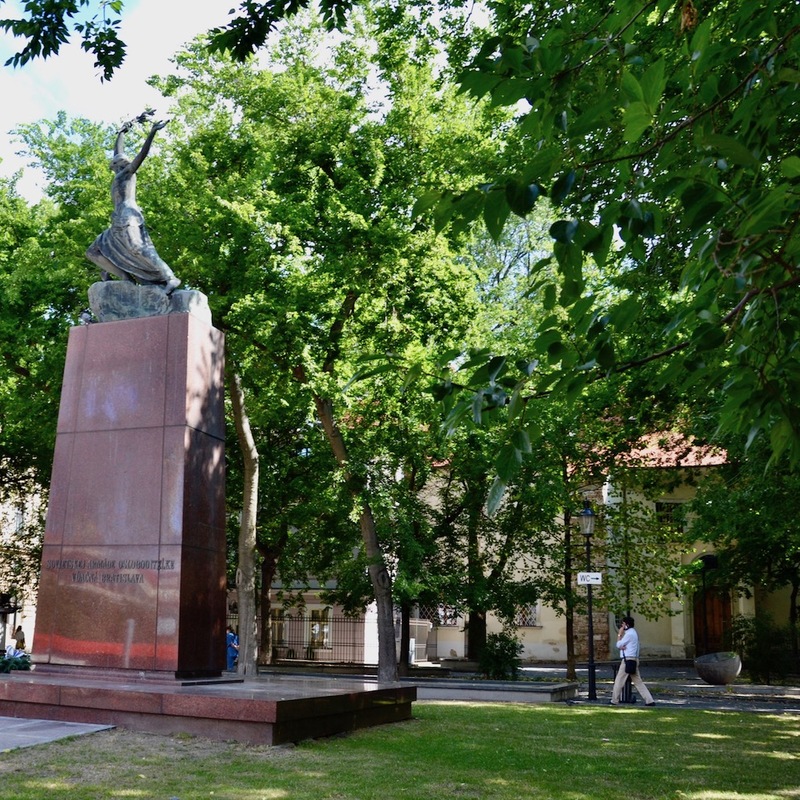 Thus, this monument that honours Ludovit Stur, a 19th Century leader of the Slovak language revival, overpowers this small square. 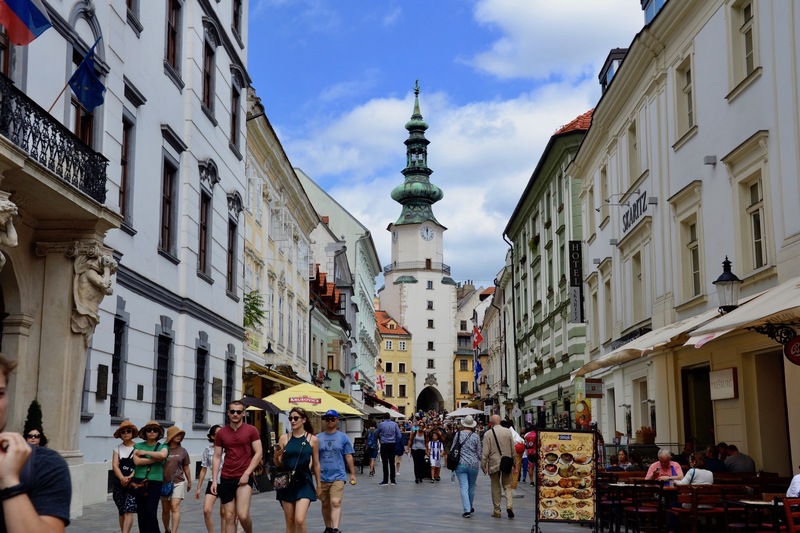 Most of the old town is pedestrian only; this allows you to walk calmly through the city and we move on to Hviezdoslav Square, named for the famed Slovak poet. 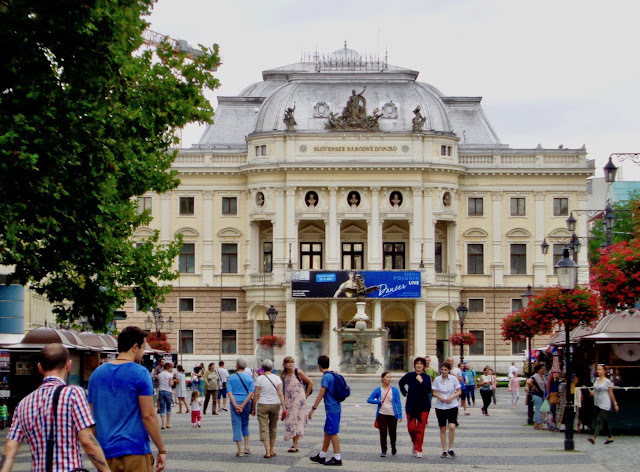 This is a large historic square bordered by trees and features restaurant patios, hotels, fountains, and the Old Slovak National Theatre. Off to one side is a small church – the focal point of the 25 March 1988 Candle Demonstration. 5,000 people gathered in front of this building holding candles to peacefully press the Communist government for more religious freedom. They were brutally repressed by police using batons and water cannon while Czechoslovakian leaders watched from the adjacent Carlton Hotel. 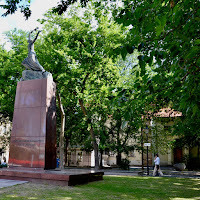 A small semi-spherical memorial commemorates this event, standing modestly in the shadow of the ‘Statue of Liberty’ a monument to the 1948 Soviet Army invasion that annexed the country. The demonstration, a pivotal point in the overthrow of communism 18 months later, is still observed every 25 March. There are a lot of small statues in the old town. 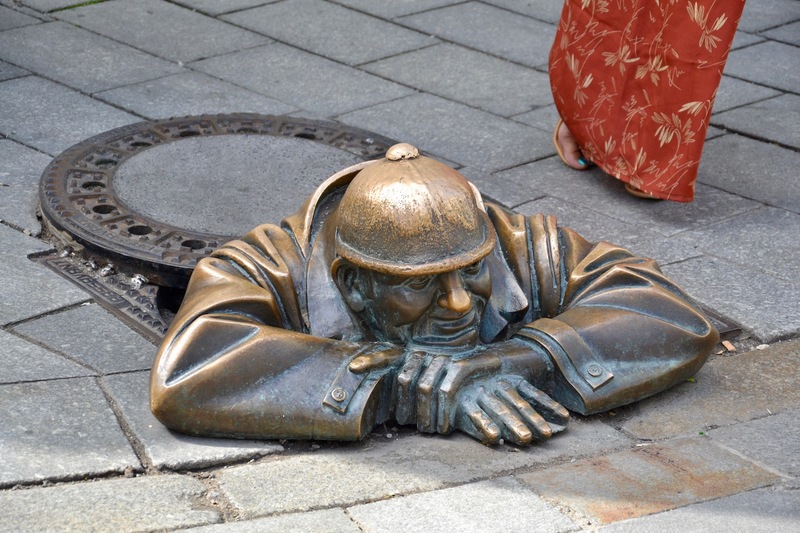 We encountered Man At Work just north of the Square; ‘Cumil (the Watcher)’ in Slovak, is positioned in a manhole where he looks into the street. Under the Austro-Hungarian Empire only the rich could promenade around the town idly, and observing them was a local fascination. But under the Soviets, everyone kept on the move, with their heads down – attracting attention would risk arrest. 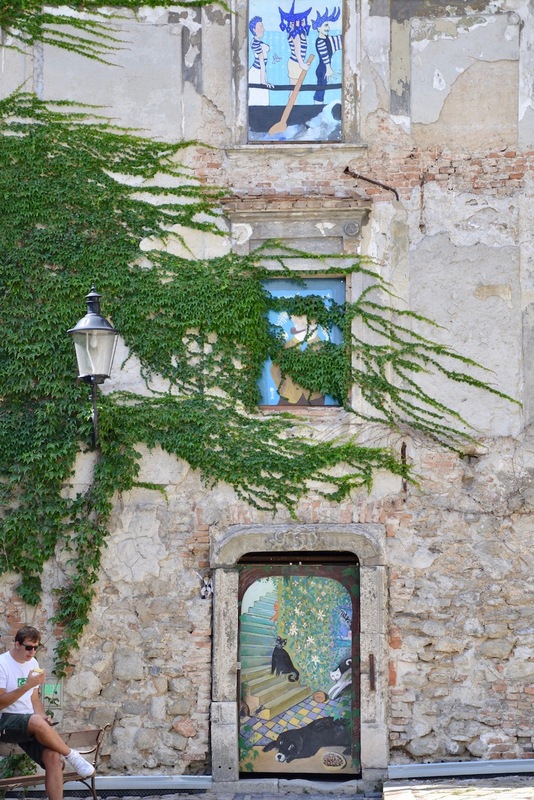 He was installed in 1997 as part of Bratislava’s old town renovation, attempting to recapture its spirit and whimsy. Other statues from the renovation include an old man with a top hat (Schone Naci), a Napoleon soldier leaning on a street bench, and a Paparazzi. 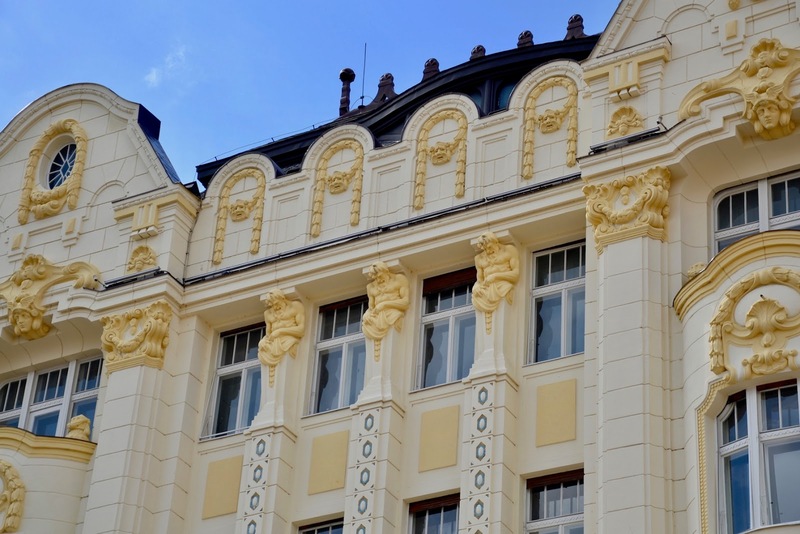 Like its sister city Prague, Bratislava has managed to conserve its pre WWI Art Nouveau heritage, despite a series of invasions, with a number of richly adorned buildings – making me wonder why don’t we make buildings like this anymore. Nazi Germany created the Slovak Free state at the commencement of WWII and most of its significant Jewish population perished in Nazi concentration camps. Those that survived returned to find they were not welcome and by the time the Communists came to power in 1949 most had emigrated. A monument depicting Open Doors, on the site of the old synagogue, commemorates those that never returned. It stands just below St Martin’s Cathedral and it was while here that a curious coincidence occurred – I saw graffiti of a bear on a bike and took a shot, but a cyclist crossed my vision, so I reshot it. Only later did I see what had happened – I couldn’t have captured that shot in a million years. We walked up to 15th Century St Martin’s Cathedral, known as the Coronation Church; for almost 300 years the Kings of Hungary were crowned here. As well the Hapsburgs, including Maria Theresa, came to this cathedral for their coronations, even though their residence remained in Vienna. But, it was another hot day and time for a cool one as we sat at a sidewalk café in the shade, right beside the Keglevitch Palace where Beethoven gave piano lessons to ‘Babetta’ Kegelvich – he also dedicated several pieces, that he composed here, to her. We didn’t have much time; we were taking a trip out into the Slovak countryside right after lunch. So, we drank up and strolled back to the ship taking in some live music as we walked. Sadly, we didn’t get to St Elizabeth’s Church, an art nouveau gem known as the Little BlueChurch, but that gives us reason to come back. 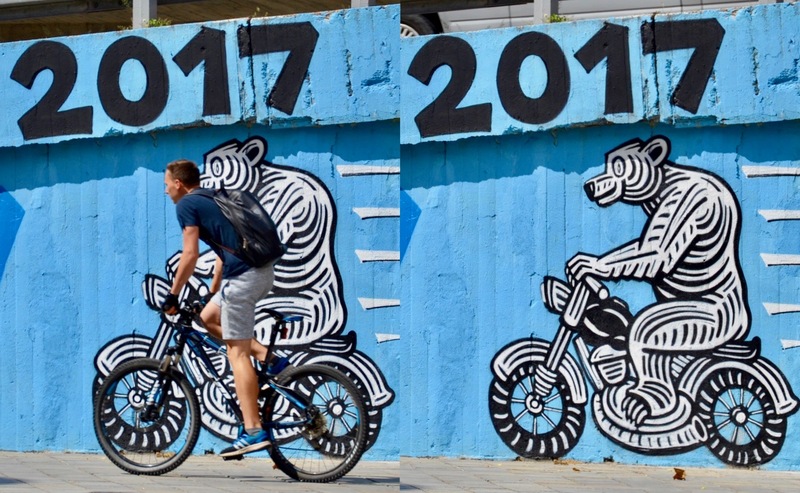 Interesting city to visit and cool shot of the bear and human cyclists. It's certainly a place we'd love to revisit, Susan. Love that guy in the manhole! He's a popular fellow, that's for sure! I had to wait a few minutes to photograph him.